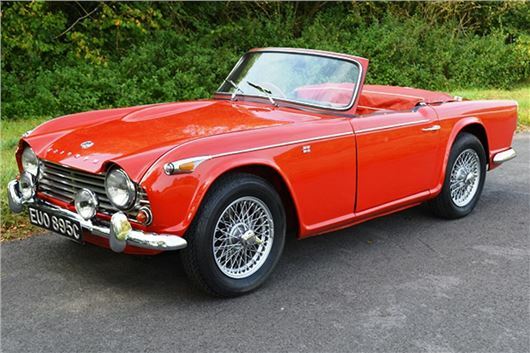 I have reached the stage where it is time to move my TR4A permanently on and it is being passed down the line to my son who lives in the South of Spain. Hopefully in a couple of months time the weather will have improved so I will be heading down south. I intend to go via Switzerland, France and then obviously Spain. I am aware of the fundamental requirements e.g. lights, warning triangles, high viz vests, etc. However, are there any less obvious issues with respect to driving itself? I understand in Spain it is a legal requirement that, having overtaken another vehicle, one must indicate when moving back to a slower lane. Your advice would be most welcome. Yes. Of course it makes sense to signal when you come back in again anyway. Autoroute tolls are stiff. 80 Euros just to get to Switzerland, then £30 for the annual vignette. I drove down yesterday. You’ll save 25 Euros by getting off the A5/E543 at Langres and taking the E54 to Vesoul, then the E23 to Besancon, the E83 to Poligny then the E5 via Champagnole and Merez. With any luck you won’t have to buy a Swiss motorway vignette as long as you avoid Swiss motorways. I have a 2009/59 Nissan Note n-Tec automatic with a 1.6 litre petrol engine. It has done about 28,000 miles. I have had it from new. Recently the engine seems very noisy between 40 and 60mph (I haven't really taken it much faster than that because of the engine noise). Possibly as if the car needs to change gear but isn't? Do you have any advice or suggestions as to what the problem might be? I intend changing my Subaru Forester XT Auto petrol later this year when the facelift announced at the Tokyo Motor Show hopefully becomes available here. Subaru has reportedly included a "better ride quality" in the tweaks and this is of great interest to me since this is the only (slight) gripe I have with this otherwise excellent car, the latest of several I’ve enjoyed. However, since I shall be stuck with 18in wheels, it occurred to me that a change of tyres might give a better ride. The car is never used off road, so do you think there could be an alternative tyre choice worth considering? In December I switched from 205/55 R17 Michelin Primacy 3 to Michelin Cross Climates on 'my' Honda HRV and immediately the ride became softer, more compliant and quieter with no detriment to the fuel economy or the handling. Cross climates will be available in size 235/60 R18 from May. I have a 2012 BMW 116i Sport, which I bought 2 years ago. I had new tyres fitted as part of the deal. I do low mileage (less than 5,000 pa), mostly local. Earlier this month the car had its second MoT, which it passed. However there was an 'advisory' stating that both rear tyres had nails in them. The car was serviced at the same time by my BMW dealer (I still have the 'service pack') and there was no comment about the tyres in the service report. I asked the dealer about the MoT 'advisory' and was told not to worry; the car's system would warn me if the tyre pressure dropped and the tyres could be inspected and if necessary replaced at that point. They cannot be repaired. I was told it was perfectly safe to go on driving. The tyres are 'runflat'. I'm uncertain. The dealer's advice seems logical, but I'm not comfortable knowingly driving with two tyres that have nails in them. I can afford to replace the tyres, though they are expensive. What do you think? I wouldn't be happy about that either. The TPMS will warn you if there is a significant loss of pressure. However, runflats can be repaired, just like conventional tyres, if they have not been 'run flat', and as long as the screws are in the tread and not close to the shoulders. A dealer would not have noticed the screws in a standard service. An independent specialist who drained the oil from the sump plug would have had a walk around under the car while the oil drained and might have noticed. I am 82 years old and drive a 2002 Toyota Camry 2.4CDX auto, which has completed 104,000 fault-free miles. It is extremely comfortable and reasonably economical. It has been regularly serviced and still drives like new, but I wonder how long I might expect it to continue to give me such outstanding and reliable service. If you consider that it is about time to consider a change, what would you recommend I buy that is very comfortable, reliable and easy to get in and out of? I have a budget of £20,000 and would be happy to buy a used car not more than 3 years old. Two options: Since the car is now worth very little, your first is to carry on driving it until something goes wrong that costs more to fix than the car is worth. The other is to switch to a newer car. A Toyota Avensis 1.8i Valvematic Multidrive S makes sense, or a Toyota Prius, or a Toyota Auris hybrid. Is it necessary to inform my insurance company of a minor graze to the front plastic apron of my car, caused by coming in contact with a low piece of stone when extricating myself from a difficult parking space on private land in the dark? No damage to the stone and I intend to touch up the scrape myself. I would prefer not to have it on my record for 5 years. Definitely don't tell them anything. I find the ride of my Mk VII Golf Estate harsh over almost anything but smooth road surfaces and I wonder if a change of tyres would improve it. It came shod with Hankook Ventus Prime 2 205/55R16 91V. Can you advise? Yes. Switch to Michelin Cross Climate and lower the pressures slightly. We have a 2007/57 VW Golf GTi 2.0 Turbo. We had no problems with this excellent car since we purchased it in April of last year. During the past 2 weeks we have experienced a high pitched screeching sound coming from the engine compartment. I did at first think it was a vacuum problem, with air escaping or being dawn in through the oil filler cap, so I changed it for a new one, but to no avail. Last Friday, we drove from Tonbridge to see a friend in Battle. About halfway through our journey, the confounded noise started again. I did inspect the belt that’s visible in the engine compartment, this looked okay. The camshaft belt was last changed when the car had done 43,700 miles; current mileage is 65,000. The noise persisted on and off, mainly when the car was revving between 1,000 – 2,000rpm. Have you heard of anyone else reporting a noise like this on this model of car or would you have an inkling as to the source of the noise? Timing belt tensioner bearing, waterpump or alternator. Brilliant. Well done. Shows how much Renaults have improved over the past 15 years. £6,300 is fair for the car. I have just been browsing the new tax laws for 2017 and it would seem that cars like my 1997 Carina E 1.8 would be rated at £1,200, which is crazy. Or is there going to be an exemption for cars of that age being that they are modern classics? The new laws are for new cars first registered from April 2017. The two different sets of rules for CO2 based tax and pre-CO2 based tax will still apply for existing cars, but the rates were raised very slightly in the March 16th Budget. I should appreciate your advice on the use of one of the many firms that advertise their services to carry out minor body repairs at one’s home. My car has one or two relatively superficial scratches of no great length and a couple of small spots where the paintwork is damaged, along with a dent kindly provided by a third party (the sort which would tend to be ignored if the sole blemish). I currently have a 2009 BMW 330d CI coupe. It's covered almost 88,000 miles. I recently had a new manifold put in (because it was blocked with carbon), new EGR and recently fitted 4 brand new Bridgestone tyres. I've only had it about 15 months. I was wondering how long should I hold onto the car after having spent a significant amount on it? The car is lovely to drive, especially on the motorway. Around town it's a bit harsh but I'm used to it now. Should I be looking to replace it soon? I service it every 10k with fully synthetic Mobil 1 engine oil and exclusively run it on Shell V-Power Nitro Plus diesel. I'd probably want something with similar power and economy as a replacement. My mother currently has a 2013 Ford Fiesta 1.0 Zetec Ecoboost and loves it, but there are two problems; She never truly liked the colour, whereas she loves the Hot Mustard yellow of other Fiestas; She now wants to switch to an automatic. The only vehicles we can find with auto in the colour are the 1.6 engine. We have found a good deal on one at £11,799 on a 65 reg with less than 2,000 miles, but I'm not sure about the engine as I've read some bad reports about it, and the Powershift gearbox too, but also there are quite a few stories with the 1.0 EcoBoost which we have never suffered with. She mainly does low mileage, town driving of around 4,000 miles per year, so we just need something suitable for that. Finding one with the spec she wants for less than £12,000 could be difficult, but I've seen some new Fabias that come within the criteria. I like them but are they trouble? Fiesta 1.6 and 1.0 engines okay, but quite a few problems with the Powershift transmission. See the entries in: www.honestjohn.co.uk/carbycar/ Fabia automatics are DSGs with the same problems. Better a Hyundai i10 or KIA Picanto automatic, both of which are 4-speed torque converter. Not enough money for a Mazda 2 1.5 6-speed auto.